With all the cars of today coming out with a Hybrid version and some manufacturers coming out with all electric cars, we wanted to help clear the air in regards to the longevity of the HEV batteries. These Hybrid vehicles have been out since year 2000. They have now been starting to experience the joy of "Battery Module Deterioration". Well, the truth is, there is no battery that lasts forever. If there is, the cost to manufacture it must be astronomical. The HEV batteries from most manufacturers are under warranty for 10 years 150,000 miles in California, so there is some sweat off the brow, and they seem to survive that long before the trouble light comes on. The concern is, that well before that time, the battery is deteriorating, thus causing some performance loss and MPG loss. Our philosophy is that we should be able to service, or "condition" the pack before it goes "bad", which you will understand in a bit. 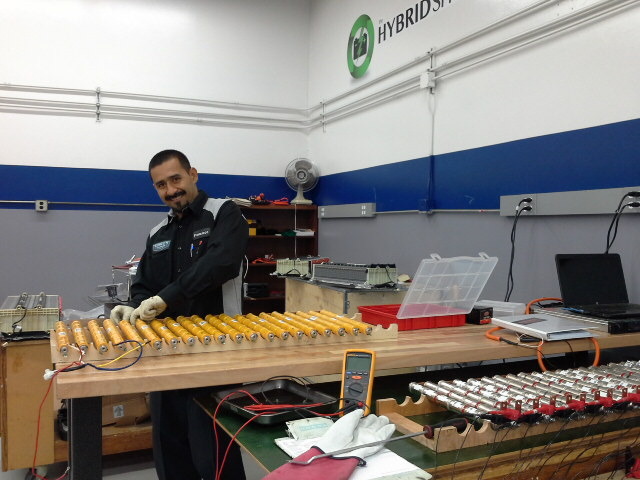 You can now purchase replacement "remanufactured" HEV batteries when your battery is bad. This remanufacturing process is performed by taking "bad" battery modules and "conditioning" them and taking out the individual modules that have been run down for too long. The process does work for helping these batteries recover what they have lost, but the price tag to have the battery replaced at a shop will still run you $3,000 or better. We have become one of a handful of dealers in the country known as The Hybrid Shop and have taken some advanced training and own proprietary equipment that allows us to perform the "conditioning" process "in house". Our equipment actually balances the battery pack more effectively than the methods out there today. This allows us to not only replace your HEV pack if you want, but more importantly, we can "condition" your existing pack saving you money, and ending up with a better product. This also helps the environment by keeping these batteries from being unnecessarily discarded. So, as you can see, you can wait until your battery dies and either purchase a "reman" or have us "condition" the pack and replace any faulty cells, OR, get the pack "conditioned" while it is still in fair shape, and not have to replace ANY cells, not lose ANY power, or ANY MPG....We are attempting to have the manufacturers accept the battery "maintenance" idea, so they will warranty less batteries, and less will end up in the waste stream...Seems like a no-brainer to us! !